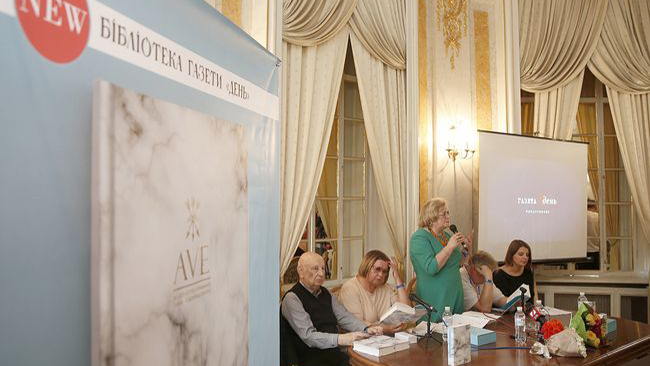 LVIV – The 25th Publishers’ Forum culminated in the launch of Den’s new book entitled Ave: The Centennial of Pavlo Skoropadsky’s Hetmanate in the Mirror Hall of the Potocki Palace. The ceremony was presided over by the Project Coordinator and Editor-in-Chief, Larysa Ivshyna. Also present were Ihor Siundiukov, the compiler, and the authors of the features included in the book: Yurii Tereshchenko, Tetiana Ostashko, Petro Kraliuk, Anna Danylchuk, and Ihor Smeshko. There was a special Ave Scent smell in the air during the launch of the book, courtesy of Partisan Perfumes CEO Oleksandr Perevertailo (his products were launched that same day at UAKrasa Boutique). What do we know about Hetman Skoropadsky and his epoch? Why is this knowledge important for us after a hundred years, considering that much has been done to falsify this history under the Soviets? What political tradition are we to adopt? These and other questions were raised on a panel traditionally coordinated by Dr. Iryna Kliuchkovska, Director, International Institute of Education, Culture and Contacts with Diaspora, Lviv. Ms. Kliuchkovska told The Day: “I feel especially responsible when presenting your Library Series books. To quote Ms. Ivshyna, this project has worked out the concept of Ukraine’s humanitarian policy. This is true and your new book, commemorating centennial of Pavlo Skoropadsky’s Hetmanate, is a first rate intellectual product. The years named after prominent Ukrainians aren’t a formality but a signal for our society. Remember the years named after Prince Yaroslav the Wise, Prince Volodymyr Monomakh, and Konstanty Ostrogski? This prompted our society to ponder some important points, something without which our progress wouldn’t be possible. This was like a traffic light pointing the direction, but always with a green light, showing us the long-awaited way to our national identity. Much can be said on the subject, but I guess the reader will make the necessary conclusions – whether to drive on or wait for the red light that leads nowhere. “The Year of Hetman Pavlo Skoropadsky is an opportunity to study a period in our history which is marked by complex problems while trying to build a Ukrainian nation-state. Those problems weren’t solved and the state was never built a hundred years back. This is another lesson we should heed; we have to figure out what was done right and wrong at that period, and how to use this experience now. Personally, I’ve figured out three lessons worth listening to. “Lesson One: People who come to power must learn to place the national interests first and their own interests second. “Lesson Two: Everyone knows about the advantage of taking a position of strength. We must take this position from within and keep strengthening it. “Lesson Three: After taking and upgrading this position of strength, we can make further moves and use external factors. “Your book about Hetman Skoropadsky certainly addresses our society, although I wouldn’t count on our politicians – they’re too busy with the coming election campaign. I believe that this book will interest college/university lecturers, students, schoolteachers, and their students. I do hope that it will have the desired civic effect. This book contains features written by our top-notch authors. I was happy to meet with Ihor Siundiukov, Petro Kraliuk, Ihor Smeshko, Yurii Tereshchenko, and others who had helped it appear in print. It is an excellent analysis of Hetman Skoropadsky’s epoch. I appreciate Editor-in-Chief Larysa Ivshyna’s Foreword. It offers the main points for our progress. It is about the gap between those and our times, the importance of filling this gap; it is about our destiny, national identity, the nationwide lumpenproletariat campaign [under the Soviets – Ed. ], the so-called Ukraine-Rome Road, a link between civilization and barbarism. We each of us must decide which road we have to embark upon. “Ms. Ivshyna writes that Hetman Skoropadsky was a nation-state-building impulse and compares him with Baron Mannerheim, the father of Finnish national independence. She accurately notes that there is an abyss between the Ukrainian elite and the man in the street, and broaches other important issues, including Viacheslav Lypynsky and Fedir Lyzohub. There are historic figures we have to figure out. There are many parallels to be drawn between past and current realities in Ukraine. Our older generation has to establish contact with the younger one. We must explain to our young people all those complicated processes and encourage them to read such books. “I’m convinced that the book about Hetman Skoropadsky is among the best to have appeared in print, and that it will help our education process. As a university lecturer, I promise to make every effort to have it included in our college/university curricula. Doubtlessly, this book is another significant accomplishment on the part of Den. It is another victory won by all of us who want to learn the truth about ourselves.